Headlies: Bray Wyatt Celebrates His Wrestlemania Streak - WrestleCrap - The Very Worst of Pro Wrestling! 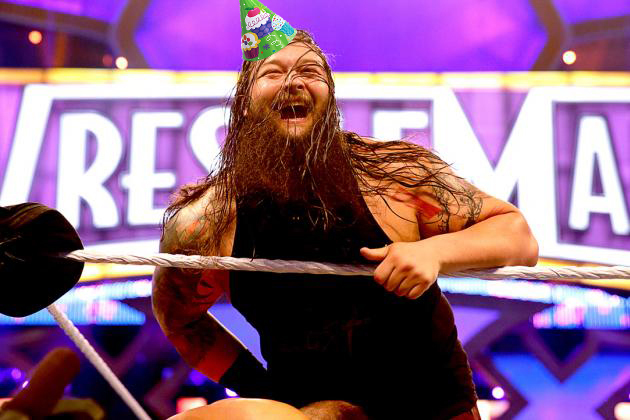 Somewhere in the backwoods, FL – WWE Superstar Bray Wyatt celebrated the continuation of his Wrestlemania losing streak with the entire Wyatt family. Bray’s words were greeted with an frantic hooting and hollering from his family. Though Bray had “set them free”, both Luke Harper and Eric Rowan were there to join in the fun and merriment with the rest of Bray’s kin. Harper told inappropriately scary ghost stories and Rowan gave “sheepy-back” rides to all the little ones. Uncle Cooter Wyatt played the mouth-harp while the twins Pepsi and Mr. Pibb accompanied him on the saw. Granny Wyatt danced a jig as Bray’s sister Abigail cooked up a mess of possum stew and buzzard slaw. The clan laughed uproariously when Rowan tried to eat with his mask still on. Before the meal, Bray raised a glass of Rowan Red wine, and made a toast. Headlies: Call The Bray Wyatt Hotline Now! 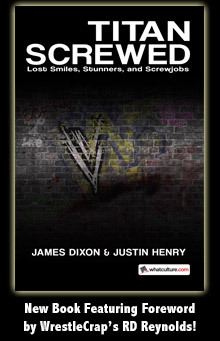 4 Responses to "Headlies: Bray Wyatt Celebrates His Wrestlemania Streak"
Seems like the Wyatt Family could’ve invited the Spucklers to their shindig, hootenanny or soiree. Didn’t Cledus say that he had a daughter Mary whose middle name was “WrestleMania?” How appropriate. If they bring in Henry Godwinn as Bray’s dim-witted, loveable Uncle/Niece, it might just save his career. He could spit moonshine at heels, and do a big banjo solo after every match. Instant ratings! That would be awesome! Banjo solos always improve things!